Letters From A Tapehead: And So I Watch You From Afar: "Wasps"
And So I Watch You From Afar: "Wasps"
Were I forced to come up with a two-word summary of And So I Watch You From Afar's newest single, "Wasps," those words would probably be "circular anthems." The constant arpeggios and choral harmonizing are dizzying to say the least, a wasp in flight possibly the basis for its immediacy and motion. You can listen to the song below. And So I Watch You From Afar is releasing a new album called Heirs on May 5th via Sargent House. For information on the release, please scroll below. All news, dates, music and links were provided by Us/Them Group. 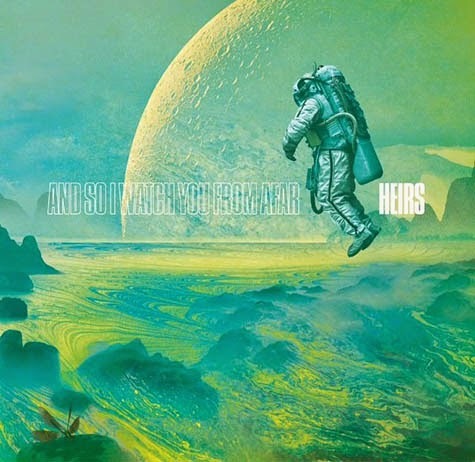 Northern Ireland's And So I Watch You From Afar premiered a new track from their forthcoming album Heirs yesterday via The Fader. The song "Wasps" is cleared for posting via Soundcloud HERE. ASIWYFA previously shared album track "Run Home", also cleared for sharing via Soundcloud HERE. Album pre-orders are available at iTunes HERE. ASIWYFA also hit the road with Mylets this spring for extensive shows throughout the UK and EU. Please see complete dates below. And So I Watch You From Afar have applied to their fourth album the same rigorous work ethic that has seen them touring nearly non-stop all over the world in recent years -- including less common tour stops like China, Russia, India and Africa. Heirs is both the band's most painstakingly created album as well as its most personal and meaningful. "Its central theme is about the inheritance of ideas," the band says. "In that we're all heirs to other peoples' passion, which in turn inspires ourselves." Many new lives, new imperatives and invigorated perspectives helped shape the 10-song album borne of over 30 tracks written in prolific isolation spanning over 6 months in the band's Belfast, Northern Ireland home. It's a work of intense focus and adventurous abandon that reaches to the heart of artistic expression. "We started making the album while touring in 2013," guitarist Rory Friers explains. "We would be recording demos in our hotel rooms, back stage and we would even hire out rehearsal rooms during days off." Being the first album with new guitarist Niall Kennedy (who joined as a touring member in 2012), the band grew increasingly productive taking half a year off from the road and working nearly every waking moment together in their rehearsal room. Friers and Kennedy, along with drummer Chris Wee and bassist Johnathan Adger amassed about 30 new songs, which were then whittled down to 15 tracks. Of those 15, only 10 songs made the final cut, carefully selecting those that best represented the ideas and feelings the band wanted to express with the album. "Its called Heirs as a tribute to a lot of new people who came into all our lives during the writing and recording of the album -- lots of nephews and Johnny had a daughter, Eisa," Friers explains. "It seems like the songs soaked up all those feelings we had during the writing. Because making the album was such an intentionally intense and full time experience none of us where listening to much other music or even experiencing much else outside of it. So, it feels like a very pure representation of what happens when these four people decide to make music together. It was a very intense time and the record has been shaped by that." Heirs will be available everywhere on LP, CD and download on May 5th, 2015 via Sargent House.